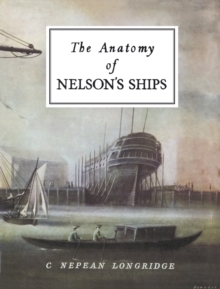 Nelson's history has been written from every possible angle, but this is not so with his ships. Such information as there is about the ships is buried in contemporary books on naval architecture; only the expert can sift it and present it in a usable form. In doing this, Dr. Longridge's 1955 work quickly became a veritable treasure trove for the naval historian and ship modeler. H.M.S. Victory is the supreme example of the ships of the period, and fortunately she is still in existence. The original draughts of 1765 have been preserved, as have also the drawings used in the restoration of the ship in 1922. The author was thus able to compile from authentic sources and his model of the Victory now occupies a prominent position in the Science Museum at South Kensington. The illustrations are a unique feature. They include a set of photographs showing the interior construction of H.M.S. Victory and H.M.S. Implacable, the latter being taken only a few days before she was scuttled. The book features over 180 line drawings, designed by E.
Bowness, A.R.I.N.A., and executed by G.F. Campbell, Assoc. M.R.I.N.A., ranging from elaborate perspective drawings of the complex gear at the fore top and crosstrees to the simplest detail. The folding plates by G.F. Campbell (which measure 560 x 400 mm and 235 x 450 mm) include lines, inboard and outboard profile, deck plans of the hull, standing and running rigging plans, and a complete belaying pin plan. Such an analysis of the ship of this period had never before been attempted.